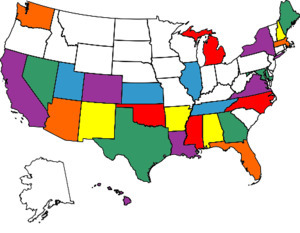 I consider myself fairly well-traveled within the United States thanks to many family trips when I was a kid, but last month when I used the Visited States Map website to figure out just how many states I’ve been to (see the picture above) I was dismayed! I’ve only visited 27 states! I’m was conservative during this determination since I didn’t count states where I’ve only been in an airport – like New Jersey (Newark), Kentucky (Cincinnati), Missouri (St. Louis), and Minnesota (Minneapolis). Catching a connecting flight doesn’t really equate to actually being there, I decided. As a side note, how is South Carolina such a gaping hole in my map? I can’t believe that while growing up in the South (I didn’t leave until I was 23) I never made it to South Carolina. It makes me feel like a traitor to my home region. But back to the issue at hand. Since one of my goals in life is to visit all 50 states (Alaska is going to be the toughest, I think), I figured 2014 was as good a time as any to get started on increasing my number. Believe it or not, this business trip to DC has helped out quite a bit already. Of course I’ve been to Virginia and Maryland a number of times before, but there are other states not far away that I’ve never set foot in. Like West Virginia. And since I can’t imagine I’ll have any other opportunity to go there in the future, when I landed at Dulles yesterday I picked up my rental car and headed west! I booked a hotel room in Morgantown, WV (home of West Virginia University) for the night and it took me about four hours to get there. During my little adventure I learned two things – 1) Morgantown is a lot farther from DC than I thought, and 2) My rental car is terrible for road trips. Holy back pain! But it was a beautiful drive and I really enjoyed it. I’ll write more about my trip in another post, but as of this morning I’ve now visited 29 states! This resolution is going to be an easy one to keep.